The unshakeable spirit of our officers shone through during the Trump-Kim Summit. Thousands of Singapore Police Force (SPF) officers worked tirelessly round the clock to ensure the safety and security of the summit. Police Life shares with you some of the anecdotes from our officers who let us in on their thoughts about the summit. 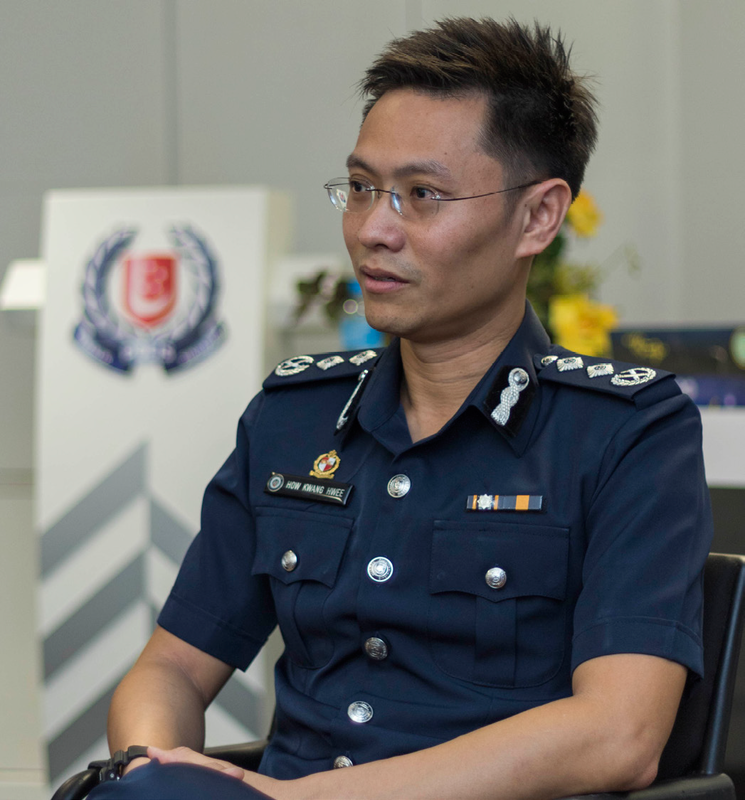 I am Senior Assistant Commissioner of Police How Kwang Hwee. As the Director of Operations, I led the planning and execution of security operations for the summit. Together with officers from the SPF, we worked closely with security agencies in the Home Team, Singapore Armed Forces and private stakeholders. Our experience in providing security for large-scale international events allowed us to overcome the challenges in the planning and execution of security operations for the summit. We only had a few weeks to plan for this high security event that was closely watched by people across the globe. Planning for such events would typically take months. In addition, both the United States of America (USA) and Democratic People’s Republic of Korea (DPRK) security teams were very focussed on the security for their leaders and we had to engage them closely to develop and coordinate plans. Like many police officers, I worked long hours with little sleep for several weeks, working closely with security agencies to ensure that plans were put in place. We had many hours of meetings, discussions, ground recces and exercises in the lead up to and during the summit. The strong team spirit and camaraderie kept me going. The success of this security operation was down to the professionalism and commitment of officers from the SPF and security agencies involved. I am proud that I had the opportunity to work alongside fellow police officers to play our part in ensuring the safety and security of the summit. I am Assistant Commissioner of Police Jarrod Pereira, Commander of Clementi Division. The division was tasked with the security operations for the Capella Singapore Hotel, the venue for the summit. The security demands were intensive and planning and preparations were done within a few weeks. We had to ensure that all security measures were not only robust and practical, but agreeable to, by both the USA and DPRK. Although the summit coincided with the June school holidays and the month of Ramadan, the officers stepped up, persevered and pressed on. Many cancelled their leave or came back earlier than planned, from their holidays. The officers have achieved their mission, and are proud to have been part of this historic event in Singapore. I am Assistant Commissioner of Police Devrajan Bala. As the Commander of Jurong Division, I oversaw the security operation for The St. Regis Singapore hotel, where the DPRK Leader and his delegation resided during the summit. Anticipating the language barrier between my team and the DPRK officials, we started sourcing for Korean speaking police officers to be deployed with my team. Owing to our Korean speaking police officers, we were able to work effectively with the DPRK security team, who spoke little or no English, and the hotel management to put in place various security plans. One of our security plans involved a “lock-down” at the hotel lobby to manage the DPRK Leader’s movements in and out of the hotel. One interesting incident arising from the “lock-down” took place when a male hotel guest who was only clad in a towel was stranded at the hotel lobby after returning from a swim. My officers quickly intervened and convinced the DPRK security team to allow the guest to return to his room. While security was important, we were always mindful to balance this with the inconveniences caused to other hotel guests. Despite the challenges, this operation was an extraordinary experience which will be remembered by all my officers who had worked tirelessly to ensure the safety and security of this historic event. I am Assistant Commissioner of Police Tan Chia Han. As the Commander of Tanglin Division, I oversaw the security operations for the Shangri-La Hotel where President of the United States (US) resided at. My team had to work very closely with the US Secret Service to ensure the safety of the President. Given the scale of operations and the nature of the summit, it was expected that we as police officers had to work round the clock to ensure the security of the area. The intensity was exacerbated by the fact that the team had just completed operations for the Shangri-La Dialogue a week ago. Given the back-to-back deployments, the work demands on our officers were tremendous. While sacrifices were inevitable, I am thankful and proud to see the dedication and commitment that the officers in my division had for their work. The strong sense of pride and mission-oriented spirit which they displayed were highly commendable. I am grateful to be working alongside such motivated officers. I am Inspector (NS) Gim Joo Hyung, an operationally-ready National Serviceman with the Police Coast Guard. When I was first approached to be a translator for the Korean officials during the Trump-Kim Summit, I was hesitant as I lacked the translation experience. However, with the encouragement from my parents, I volunteered to do my part for this historic summit. During my shifts, I was responsible for ensuring the safety and security of the officials on top of my translation duties. I helped to bridge the language barrier between English and Korean speaking individuals. While there were instances where I had difficulty translating uncommon military terms, I was not discouraged and at times sought help from my mother. While the hours during my shifts were long and exhausting, it was a fulfilling and rewarding experience that I had no regrets. I am Deputy Superintendent of Police Ong Yoke Wen. As an Operations Officer (Planning and Readiness) from Tanglin Division, I was part of the security and contingency planning team responsible for securing the grounds at Shangri-La Hotel leading up to the June 12 Summit. Due to the intense and unpredictable work schedule, I had to work overnight at the Shangri-La Hotel. Since I was unable to be home with my family, catching a glimpse of them over a quick video call was a tremendous morale booster for me. Though it pained me whenever I saw the quivering smiles on my four and six-year-old children during the video calls, I felt assured to know from my husband and parents that they were well cared for. I cannot emphasise how grateful I feel as, without my family’s support and understanding, it would have been difficult to focus on my work. While we were no stranger to the erratic hours and demands expected of us during security deployments, being able to contribute to the safety and security of a historic event hosted in my country gave me an added sense of satisfaction. I am Police National Service (PNS) Inspector Abdul Hadi Bin Abdul Samad. Just like regular police officers, full-time PNS officers are equally committed and focussed in discharging our duties. As a Deputy Officer-in-Charge from the Protective Security Command, my team and I were the first line of protectors against security threats. Besides manning the vehicle as well as person checkpoints, we also conducted perimeter patrols at the Shangri-La Hotel. As a supervisor, one of my priorities was to take care of my fellow troopers’ well-being and safety during this deployment. As this is the month of Ramadan, fellow Muslims officers like myself fast from sunrise to sunset. Despite being deployed for extended shift hours, the absence of food and drinks does not deter me from fulfilling my mission effectively. Being entrusted with frontline duties to ensure the security of the summit was something that I took pride in. I am honoured to be part of the security arm that safeguarded this historic event. I am Sergeant Lee Shan Hui, a Volunteer Special Constabulary Officer with the Singapore Police Force. When I first caught wind that Singapore will be hosting the highly-anticipated Trump-Kim Summit, I knew that I had to be a part of it and immediately volunteered to serve in this security deployment. As part of the roving team based in Resorts World Sentosa, fellow regular police officers and I had to continually be on our toes to ensure the safety and security on the ground. Though it was mentally and physically exhausting as I had to cope with the extended shift hours, being able to do my part for this historic summit is a truly once-in-a-lifetime experience that I would not trade for anything. I cannot help but feel a broad sense of satisfaction since the summit went on smoothly. For now, it is back to my day job as a physiotherapist and being a VSC officer for those nights that I am on duty.